Fake news and election smear tactics linked to public officials are not just in Washington and Springfield these days. They are up close and personal in the 4th District Illinois House of Representatives Democratic race. 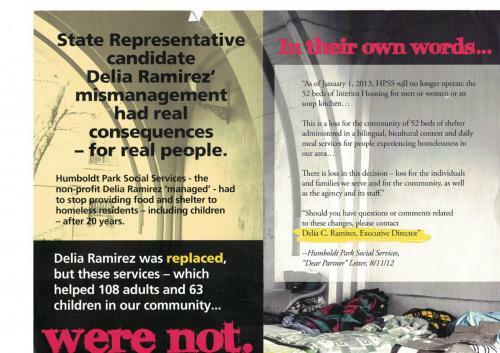 A campaign postcard mailing, tied to 1st Ward Alderman Proco “Joe” Moreno slams candidate Delia Ramirez with a mismanagement allegation in a previous job. She and two of her opponents, Alyx Pattison and Anne Shaw are pulling no punches in a cease and desist letter response. Financial records for Iris Millan, the fourth candidate, shows that Moreno’s interest in the four-way race. Friends for Proco Joe Moreno and the 1st Ward Independent Democratic Party Committee, between June 29, 2017 and Feb. 15, 2018, have provided a total of $65,000 in funding to Millan. The letter’s demand is based on violations of the Illinois Election Code and lays out who is behind the dirty tricks. In fact, Moreno, who had been on Ramirez’s Board prior to being Alderman, remained on their mailing list when she reported that funding was no longer available to continue their 52 transitional shelter beds (22 men and 30 for women and children), explains Ramirez. 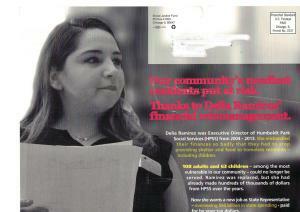 “However, I raised $80,000 to assist many of them to get into permanent housing. The rest were moved to shelters in other agencies.” HPSS continued to provide them with services. In addition, the return address on the piece is Social Justice Fund, but the Secretary of State has no record of such an entity. The bulk mailing permit is registered to Fuse LLC, doing business as Buhl Press. According to a document submitted to the Board of Ethics on May 26, 2016, by Moreno, he works as a consultant for Buhl Press, where he was formerly a Vice President. Furthermore, according to the letter, neither the Social Justice Fund nor Fuse LLC has organized as a political committee, yet the mailer is believed to have cost more than $3,000. Under the Campaign Disclosure Act, expenditures over $3,000 in a 12-month period must be done by a political committee. “Any political committee that believes any person, as defined in [10 ILCS 9/-1.6], is making. . . an electioneering communication paid for by any person, as defined in [10 ILCS 9/1.6], who has not first complied with the registration and disclosure requirements of this Article may bring an action in the circuit court against such person or persons to restrain by preliminary or permanent injunction the making. . . of such electioneering communication until the registration and disclosure requirements have been met.